There are a wide range of various ailments that can cause pain to the shoulder and in particular the rotator cuff. The rotator cuff is 4 muscles and tendons that not only provide motion to your shoulder joint but also stabilize and protect the shoulder joint. The majority of injuries to the shoulder are from wear and tear or what are referred to as a micro repetitive overstress injuries. This can occur from manual and physical jobs that require lots of overhead work such as electrical, HVAC, carpentry and construction. This can also occur from leisure activities such as baseball, volleyball and racquet sports such as tennis and badminton. Injuries of sudden onset are usually from a fall or from lifting or pulling on a heavier object. Rotator Cuff Tears – These can be partial or full tears of one or more of the tendons of the muscles of the rotator cuff that have become damaged or frayed. In many instances you don’t even realize that there is a tear but you may experience reduced motion, pain with certain motions, reduced strength and abnormal clicking or popping with motion within the shoulder. Tendonosis/Tendonitis – Tendonosis is the deteriorating of the tendon from overuse type injuries. Tendonitis is inflammation of the tendon caused by microtears from an overload on the tendon from a tensile force that is too sudden, too heavy or a combination of both. 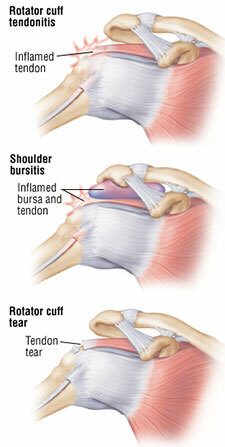 Bursitis – A bursae is a small fluid filled sac that protects the tendons of the rotator cuff from rubbing against other structures. Bursitis is when these bursae become irritated and either inflamed, thickened or both. The thickening of the bursae means there is less space for the muscles and tendons to move and can often cause pain and reduced motion in the shoulder which is referred to as impingement. For all 3 of these common shoulder conditions, a detailed physical exam will be performed and the possibility of advanced imaging may be ordered to help confirm the diagnosis. Partial tears, tendonitis/tendonosis and bursitis with or without impingement all respond well to conservative treatment in our office that may consist of manual adjustment, soft tissue therapy, modalities such as muscle stim, shockwave and therapeutic ultrasound and home strengthening and exercises. Please contact our Southwest Calgary chiropractic office, and let’s arrange a time to explore your options.